The problem I am interested in elaborating here today has to do with the difficulty of getting a grasp on oil. From the now famous claim of Amitav Ghosh—that the oil encounter lacks the same literary production and imaginary that bore witness to the spice encounter—to more recent attempts to know oil or to come to terms with living it, oil presents issues for both infrastructural and theoretical mapping. It is a moving target. As Timothy Mitchell points out in Carbon Democracy, oil tankers can be redirected to new ports either to avoid conflict or to seek the highest prices (and preferably avoiding strife also means reaping higher profits). Oil’s liquid mobility is part of what makes it a difficult target for academic study and political action. In the face of such difficulties, the work of James Marriot and Mika Minio-Paluello devises a compellingly elegant formal solution to petroleum’s historical “slipperiness” (Ghosh 141): The Oil Road: Journeys from the Caspian Sea to the City of London(2012) takes up the Baku-Tbilisi-Cehyan pipeline as the backbone of its plot, which, at the same time, spatially delimits the terrain of its story. This focus has the formal effect of creating a travelogue that is at once historically deep and politically focused. Indeed, its targeting apparatus is primarily focused on the company now known as BP. As Marriot and Minio-Paluello move along the same route as the crude pumped from the Azeri-Chirag-Guneshli oilfield they also recount major shifts in regional power, from Soviet dominance to the present multinational control. The lesson seems to be that the way to grasp oil, in both a cognitive and physical sense, is through its infrastructures just as the way to stop its crude dominance is by ceasing to engineer, build, and expand its platforms, pump jacks, pipelines, tanker routes, refineries, and pumping stations. This paper falls under the guise of what Sheena Wilson and Imre Szeman have called Petrocultures. Though you may already be familiar with the study of energy in the humanities, I will offer a brief overview of this emerging critical approach. Thinking about petroculture, simply put, involves giving energy, specifically petrol, a central role within humanities and social science frameworks. An initial task for petrocultures is to elaborate the impasse that our petro-reliance puts us in either along the lines of Imre Szeman’s provocative query “How to Know about Oil?” or through our experiences of oil life as Stephanie LeMenager proposes in Living Oil(2014). Focusing on oil means taking risks—especially that one might begin to see petrol as the source of all conflict, the substance behind all commodities, and the reason under all global political decision making. While cautioning against reading energy as the prime-mover of history, Allan Stoekl writes, “the most effective way of refusing such a reification of oil, all the while granting it the visibility it deserves, is to write its history…It’s when we think about what “oil history” could mean that we take a natural entity and recognize its cultural centrality” (Stoekl 2014, xii). Though oil presents itself as critically overwhelming, responses to it should find ways to mediate the particulars of oil and the general situation of our energy system. My aim in what follows is to take the pipeline as an infrastructural innovation of petroculture and examine the effects it produces as a narrative tool in The Oil Road. I turn to the formal innovations of writing about oil to better understand the possibilities of oil and its limits. Rather than say this outright, the authors show the reader each painstaking step in the construction and maintenance of the Oil Road, creating an itinerary of their journey and the petrol’s journey as well as a conceptual map of BPs legal, economic, and cultural dealings. The book illustrates the struggle over the way oil moves, both as substance and as fuel. The authors enumerate the juridical battles fought over the development and construction of the pipeline. 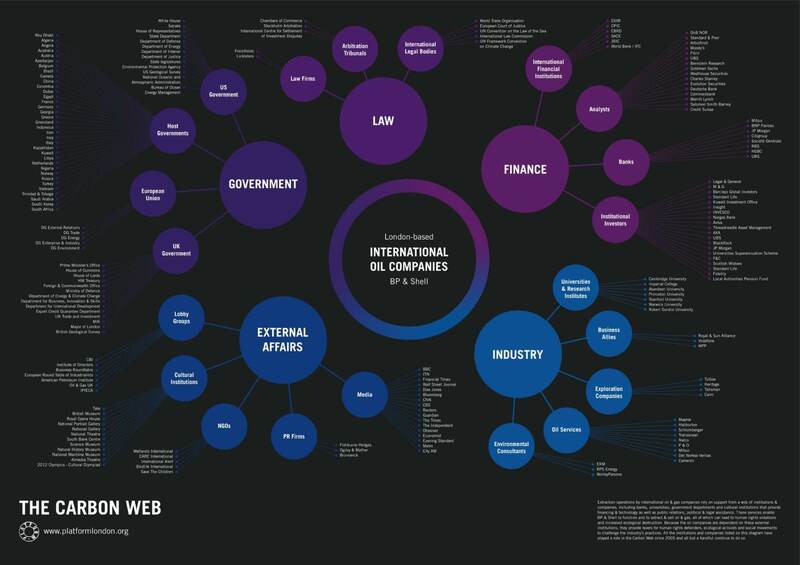 In “Without Having to Amend Local Laws, We Went Above or Around Them by Using a Treaty,” they outline the legal massaging that British Petroleum had to carry out across three countries—Azerbaijan, Georgia, and Turkey—from two other legal contexts—the UK and the USA. These “Agreements” circumvent local laws by “overriding all existing and future domestic law apart from the constitutions of the states in question” (144). Furthermore, a new tax structure was put in place to exempt the energy companies and construction companies that worked on the pipeline. Any disputes arising would be settled by international tribunals in Stockholm, Geneva, or London. The legal adjustments made on behalf of energy transport define the legal maneuvering in the struggle over the energy future. In a passage headed with the title “Burnaz, Turkey,” Marriot and Minio-Paluello write that “People have learned from the nearby experience of BTC and the Isken coal plant that battles must be fought early on. New projects need to be challenged before they are approved, financed, and planned on hard drives and flipcharts in far-off capitals” (239). The importance of these insights into the infrastructure of post-industrial energy systems seem worth emphasizing here: the development of energy infrastructure displays economic, engineering, industrial, and political effort on a massive scale. The only way to get ahead of it is to do so literally: to be ready before hand and to map before the mappers. The text also operates on a speculative register. At several points along their journey the authors encounter barriers, like fences or seas. They write, “The wells lie in a forbidden zone to which only our imaginations can travel… the route we are following is obscure. It is described only in technical manuals and industry journals, data logs and government memos” (16). And so, Marriot and Minio-Paluello attend to the mediated nature of every moment of their journey. Imagined moments, like when they describe the oil tanker, the Dugi Otok, silently gliding over the waters of the Adriatic, are no less real than when they are able to reach out and touch the pipeline itself, and moments that seem all too real are no less mediated! The form of the travelogue, in the hands of Marriot and Minio-Paluello, carefully tells multiple stories at once. The unfolding of the plot happens along the BTC pipeline, which takes the authors through Azerbaijan, Georgia, and Turkey as they follow the pipeline from the Caspian Sea to the Mediterranean. Succinctly “plot”-able on the map, the itinerary of the trip remains linear even while the authors delve into the history of region. Indeed, some of the drama of the text arrives from it fulfilling a promise it makes early: that the journey along the Oil Road will pass “through the crucibles of Bolshevism and fascism, Futurism and social democracy, through the furnaces of an industrial continent” (9). In this manner, the descriptions of the pipe’s visibility—sometimes it is buried, sometimes it runs through private property, sometimes it is under heavy guard—are supplemented by other layers of the text. As Marriot and Minio-Paluello recount stories of their previous visits to the region, they describe the development of the pipeline as technology, and offer a political history of the area from its soviet days through to its corporate present. In one particular instance they describe the seizure of Rijeka, a port city with a large refinery, in 1919 by the Italian poet Gabriele D’Annunzio who arrived “triumphantly in a red sports car at the head of a column of 297 black-shirted Arditi followers” (265); while, in another, they turn to the “outbreak of World War II,” when Royal Dutch Shell, Standard Oil, and BP, then Anglo-Persian, “shared 57.8 of the German market,” and “all three companies provided fuel to the Nazi state as it rearmed, re-industrialized, and established its structure of terror” (301). BP’s web published history passes over the years spanning 1932 and 1948 in silence. These strata of thick description in The Oil Road tellingly reveal the difficulty of knowing about energy infrastructure. Travelling the route of oil surely offers a place to start, but the book also suggests that more time is needed to grasp the magnitude of energy extraction and transport. The missing years and the strata of thick history The Oil Road make available arrive through its own familiarity with the oil archive–they are reading industry journals, promo materials, investor updates, and so on. This effort tells us about the genres of writing that oil both traffics in—engineering tracts, investor opinion, public promotion, CEO biographies—and the types of approach that a materialist critique of energy must navigate in order to register as mapping at all. In a sense, it’s a kind of political realism. Jameson goes on to say that, if one were to consider this a structuralism it is a structuralism where there is only one structure “namely the mode of production itself…, it is not a part of the whole or one of the levels, but rather the entire system of relationships among those levels” (36). What we get then, in The Oil Road, is the start of a mapping of the mode of production from the standpoint of energy. In closing, I’d like to make reference to a conversation that has been unfolding recently under the heading of Paranoid Subjectivity on e-flux. I want to attempt to avoid the risk, as Sarah Brouillette puts it, of “simply mapping the mapmakers” by emphasizing “capitalism’s mysteriousness and intractability, […] our incapacity in the face of it, [or] our anxiety about our incapacity, and so forth.” To avoid this risk, Brouillette implores us to foreground “the importance of a given map’s relationship to struggle.” The practicality of Marriot and Minio-Paluello’s map lies in its dialectic between infrastructure and form. Where the occasion of the pipeline presents a through line for plot, the tale of the Oil Road enables the story of the Carbon Web. In this sense, the text’s careful development of BP’s connections as a totality is central to its political usefulness. The labour and the maintenance of such roads comprised of pumps, steel tubes, security fences, security personnel, spouts, gauges, monitoring devices, tanker ships, refineries, more steel tubes, more spouts, more security personnel, delivery trucks, gas pumps, and on and on, is a very real, ongoing kind of work. Marriot and Minio-Plauello show us this work, which in a way helps us to understand the scope of the task at hand and to locate crucial starting places to begin to dismantle the Oil Road and the Carbon Web it weaves. Special thanks to Adam Carlson, Alexandra Carruthers, and Jeff Diamanti for their conversations and guidance as I wrote this paper. Thanks also to the participants of the session “Infrastructure and Form” at the 2015 meeting of the ACLA, especially the organizers Joseph Jeon and Kate Marshall. Buell, Fredrick. “A Short History of Oil Cultures: Or, the Marriage of Catastrophe and Exuberance.” Journal of American Studies 46 (2012): 273-293. Brouillette, Sarah. “Paranoid Subjectivity.” e-flux.com. 12 March 2015. Web. 24 March 2015. Ghosh, Amitav. “Petrofiction: The Oil Encounter and the Novel.”Incendiary Circumstances. Boston: Houghton Mifflin, 1992. 138-151. Jameson, Fredric. The Political Unconscious. Ithaca: Cornell University Press, 1981. LeMenager, Stephanie. Living Oil: Petroleum in the American Century.Oxford: Oxford UP, 2014. Macalister, Terry. “The Oil Road: Journeys from the Caspian Sea to the City of London by James Marriott and Mika Minio-Paluello – review.” The Guardian. 14 December 2012. Web. 24 March 2015. Marriot, James and Mika Minio-Paluello. 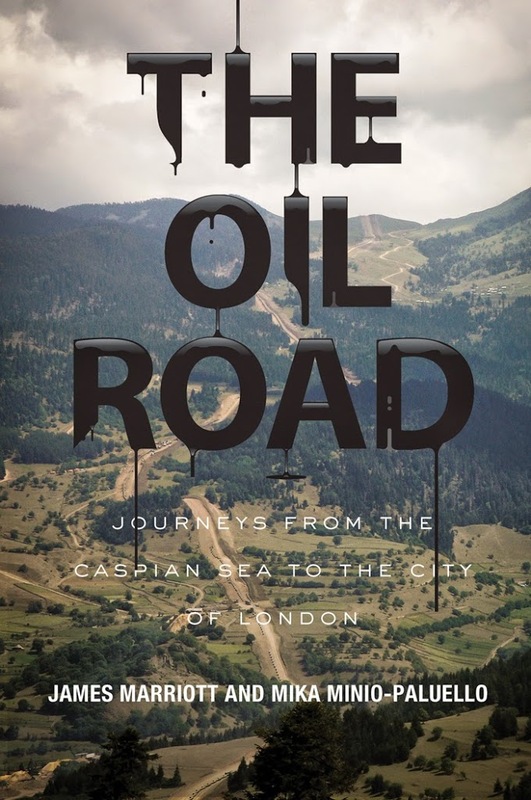 The Oil Road: Journeys from the Caspian Sea to the City of London. London: Verso, 2013. Massey, Doreen. “Mapping the Carbon Web.” Soundings 54 (Summer 2013): 127-130. Szeman, Imre. “How to Know About Oil: Energy Epistemologies and Political Futures.” Journal of Canadian Studies 47.3 (2013): 145-168.